If you're an Eloqua customer, on July 1st the new data retention policy goes into effect. Marketing activities more than two years old won't be retained in Eloqua, so, if you want that data, you'll have to keep it somewhere else. In this blog post, thanks to some really cool work by my colleagues and the folks over at Alteryx, we will walkthrough how to pull that data down with Alteryx and DataDirect Cloud. This current connection is facilitated by a third party ODBC driver from DataDirect Connectors. DataDirect has a 30 day trial whereby the ODBC driver can be downloaded for free. Alteryx also has a free trial that you can grab by going here. The credentials are already set up, so this account can be used to download the drivers on other machines. Follow the instructions on the site to download and install the driver. The link will take you to the screen in the below screenshot. Please click on the ‘Windows x64’ link in the ODBC drivers section. This will prompt the download onto your machine, if you receive a security warning click on the on the driver download arrow on the right hand side and select ‘Keep’. Once downloaded click on the DataDirect Cloud Driver install. This will open a new window, click next until you reach the below screenshot. In this window check ‘Create Default Data Source’, this will create a user DSN account in your ODBC admin automatically within Alteryx. Click ‘next’, ‘Install’ and ‘Done’ on the following windows. You can then open Alteryx and drag in an Input tool. Click on the input tool and dropdown arrow to the database connection folder. Depending on the bit version of your machine, you can either select ‘Database Connection’ for x64 bit or 32 bit Database Connection for x32 bit. In the next window select ‘New ODBC Connection’ (Below screenshot). Click on the ODBC Admin button, which will open the ODBC Data Source Administrator. Highlight the ‘DataDirect Cloud 2.0’ Name and the hit Configure. In the General Tab enter the following information (You should only have to add the Database Name. This would have been created in the Data Direct account). On the security tab back in the ODBC Cloud Driver Setup, please enter in the Authentication section ‘Data Direct Cloud User Name’ as the username. You can leave the logon domain and Data source authentication blank. You should still see the original ODBC Connection with the data source as ‘DataDirect Cloud 2.0 (User)’. In this windows just type in your Password for DataDirect, you can leave the username blank (we included this in the security tab in a previous step). This should then prompt you to ‘Choose Table or Specify Query’ within the visual Query Builder and now you can use Alteryx to make the most of your Eloqua Database! I've been watching Making a Murderer, and I did some very cursory research on the legal concept of burden of proof, and what that means in criminal trials. I kept seeing this awesome chart when looking around, and wanted to recreate it in tableau, along with the formal definition of beyond a reasonable doubt, from Wikipedia. 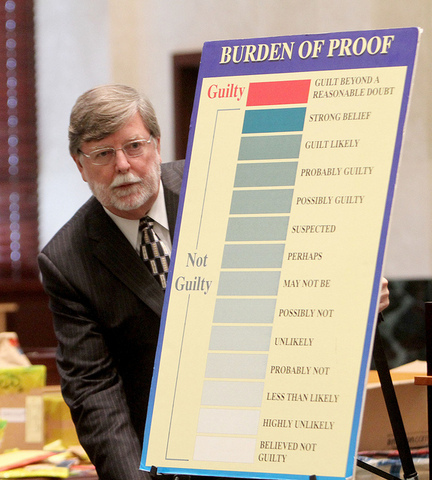 I thought it was cool that lawyers in courtrooms are using a data visualization to help jurors better understand burden of proof. They use it a lot, go ahead and Google it! I've been playing with Vizable a lot recently. I've even wrote a Star Wars and Meteorite blog for them. This has gotten me interested in practical mobile dashboarding. So, tonight, I'm creating dashboards for different mobile devices. I used mydevice.io to snag the dimensions for some popular mobile devices, and optimized and re-purposed an individual email activity dashboard. I imagine if I was creating dashboards for folks that preferred to consume their reports on mobile devices (or had to consume them out of necessity, travel, etc) I would be optimizing them for the devices I knew they carried. Here's some of the popular devices I made this dashboard in. Click through any of the images below to view the interactive dashboards. Every meteorite ever recorded by NASA. Mapped in Tableau using the new Mapbox integration, with the insanely cool ‘Space Station Earth’ custom map, that I thought vibed well with the theme of the data. 1. Go to http://mapbox.com and sign up for a Mapbox account. 2. Once logged in, click the home tab, and click to copy your unique API key to your clipboard. Leave this window open, you’ll probably come back here for that key a few times. 3. Open up Tableau Desktop v9.2 or later, and prepare by connecting to a datasource that you know has geographic fields. 6. Name your style (this is how it’ll appear in your map options, name it anything.) Paste in your API token from step two above, and either choose a Mapbox preset style (which are great) or a custom map. For this exercise, I’ll choose the Mapbox preset Emerald. 7. Now you’ve got your new map style ready. Let’s drag out some geographic fields to see what’s different. Here I drag out city, and my map looks a lot different! 8. How about zooming in on the Seattle Metro? 9. We can even drill down to see a complete street system. 10. There’s a bunch of other Mapbox presets to explore. The image below is the Comic themed map. For more inspiration, check out some of the cool maps the Mapbox community has created.